While domestic turbulences remain, the Brazilian currency experiences a relief thanks to an external factor. Itau-BBA’s report indicates that emerging market currencies were favoured by lower-than-estimated inflation in the U.S. According to the Brazilian investment bank, the good news about inflation should delay the U.S. Federal Reserve’s decision to hike the benchmark interest rate before year-end. In Brazil, inflows’ outlook is also on a positive trend. The exchange rate closed the week at 3.15 reais per dollar, appreciating 0.3% and performing in line with its peers. Brazilian Central Bank’s stock of FX swaps is currently $24 billion.The currency flow maintains the positive trend. Although foreign flows to the stock market are negative by $807 million during the month. FEW places illustrate the modern role of the Brazilian army better than Tabatinga, a city of 62,000 on the shared border point between Brazil, Colombia and Peru. The frontier, protected by Amazon rainforest, has not budged since the Portuguese built a now-ruined fort there in the 1700s. But Júlio Nagy, a local commander, has his sights trained on unconventional threats. In February and March his troops intercepted 3.7 tonnes of cannabis. Last year they destroyed an airstrip built by illegal gold miners. Inside a small army-run zoo—home to toucans, a jaguar and even a manatee—garish macaws rescued from animal traffickers squawk intermittently. The last time a big Brazilian city was attacked was in 1711, when a French corsair briefly captured Rio de Janeiro. The country’s official defence review states that “at present, Brazil has no enemies”. Lacking bellicose neighbours, armed insurgencies or much appetite to project power abroad, the defence minister, Raul Jungmann, recognises that the country’s armed forces “do not possess classic military attributes”. Brazilian strategists say that a dearth of military adversaries does not justify skimping on defence. Criminal gangs operating in border areas can overwhelm civilian police, and in the future Brazil hopes to deter foreigners covetous of its natural resources. Maintaining control over sprawling, varied terrain is not cheap. Nonetheless, new threats require new responses. And the army’s own top brass say that its current form—heavy on low-skilled personnel, light on equipment, and increasingly diverted towards routine policing—is ill-suited for the government’s stated aims. Brazil’s army burgeoned during the cold war. In 1964 its generals staged a coup; during their first year in power defence spending rose by 75%. The military budget surged again after the junta fell in 1985, as the new leaders sought to forge a modern army under civilian rule. Since 1989 defence spending has fallen from 2.5% of GDP to 1.3%, roughly the regional average. Nonetheless, the army has retained enough influence to resist nominal budget cuts. With 334,000 troops at its disposal, the government has had to find ways to deploy them. Brazil leads the UN’s stabilisation mission in Haiti, to which it chips in 1,277 peacekeepers. But its peacekeeping contribution ranks just ahead of neighbouring Uruguay’s, whose population is smaller than that of nine different Brazilian cities. For the bulk of its forces, Brazil has instead adopted what Alfredo Valladão of Sciences Po, a university in Paris, calls a “constabulary mentality”—plugging the gaps left by domestic security bodies. Many of these operations fall within the army’s mission. Federal law grants it policing powers within 150km (93 miles) of Brazil’s land border. International gangs have long been drawn to the frontier: Pablo Escobar, a Colombian drug lord, is said to have owned a cargo plane that now sits outside Tabatinga’s zoo. The army is also responsible for “law-and-order operations”. Troops are a common sight during events like elections or the 2016 Olympics. However, the army’s remit has expanded to mundane police work. Decades of overspending and a long recession have drained the coffers of most Brazilian states. Although just 20% of their requests for soldiers for emergency assistance are approved, they still make up a growing share of the army’s workload. During the past year, soldiers have spent nearly 100 days patrolling city streets—double the number from the previous nine years combined. Most Brazilians seem unfazed by this trend. Unlike politicians and police officers, servicemen are seen as honest, competent and kind. Despite the shadow of the dictatorship, confidence rankings of institutions often put the army at the top. Soldiers are trying to adapt to their new role. At a training centre in Campinas, near São Paulo, they are subjected to tear-gas and stun grenades, so they know what such weapons feel like before unleashing them on civilians. 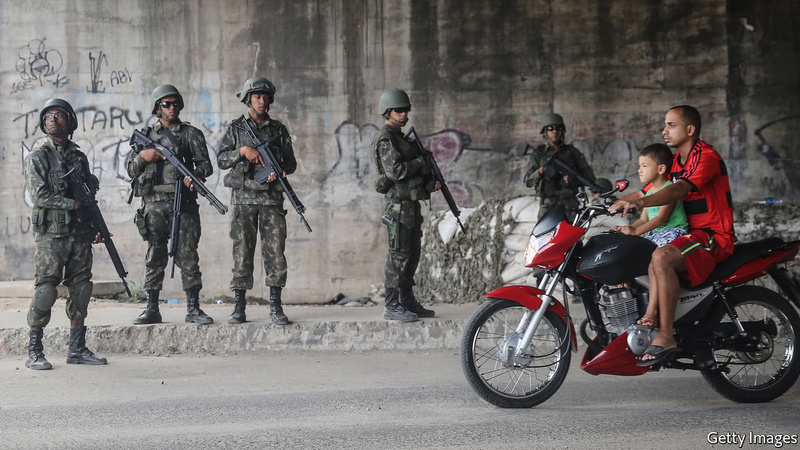 Residents of Rio’s shantytowns bemoan the end of the army’s 15-month mission to evict gangs. Once they left, the police resumed their trigger-happy ways. Soon the gangsters were back, too. Nonetheless, blurring the lines between national defence and law enforcement is perilous. Soldiers make costly cops: a day’s deployment of a few thousand can cost 1m reais ($300,000) on top of their normal wages. More important, over-reliance on the army is unhealthy for a democracy. Troops are trained for emergencies, not to maintain order day to day. And transforming a last-resort show of force into a routine presence risks undermining public confidence in civilian authorities. The army itself aspires to a much different role. A draft of the next official defence review is short on specific “threats”—the term appears just one-tenth as often as it does in a similar British analysis from 2015—but long on desirable “capabilities”. 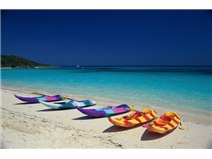 Principally, it posits, Brazil must protect its natural riches. That risk might sound remote. But if pessimistic forecasts of climate change materialise, lush Brazil might look enticing to desperate foreign powers. Refocusing the army on this priority is a daunting prospect. First, Brazil will need to strengthen its policing capacity. Mr Jungmann has called for a permanent national guard, starting with 7,000 men, to relieve the load on the army. Michel Temer, the centre-right president, backs this idea. Beyond that, Brazil’s armed forces of yesteryear are a poor fit to combat the threats of tomorrow. 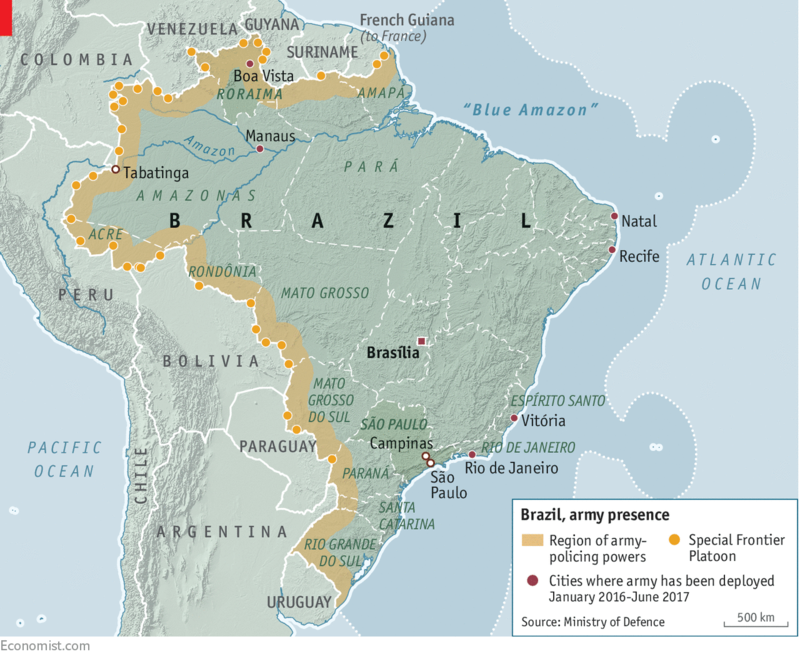 To fend off intruders in the vast rainforest or the “Blue Amazon”, as the country’s oil-rich territorial waters are known, Brazil will need a flexible rapid-reaction force, able to intervene anywhere at a moment’s notice. That requires modern equipment and small teams of mobile, skilled personnel. Yet two-thirds of ground forces work on contracts that limit them to eight years’ service, preventing their professionalisation. Three-quarters of the defence budget goes to payroll and pensions, leaving just a sliver for kit and maintenance. In the United States, the ratio is the reverse. Before the recession took root, Brazil was moving towards these ends. In 2015 it agreed to buy 36 Swedish Gripen fighter jets for $4.7bn. But spending on military equipment has fallen by two-thirds since 2012, leaving a roster of half-baked projects. An effort with Ukraine to build a satellite launch vehicle was scrapped in 2015. A space-based monitoring system intended to detect incursions covers just 4% of the border. A 32bn-real nuclear-powered submarine is nowhere near completion. And the country’s only aircraft carrier, never battle-ready, was mothballed in February. In an age of austerity, even routine operations are coming under strain. Because the air force only provides one supply flight per month to a border garrison in Roraima, a northern state, Gustavo Dutra, its commander, has to charter private aircraft at 2,000 reais per hour. And in January the army was called in to quell prison riots in the state, whose precarious finances have stretched its security budget. General Dutra frets his men may be summoned there again before long. Bradesco published this week that confidence about the economy in Brazil is up. Inflation is taking a downward turn which leads to forecasts for low interest rates in the long run. Wagner Moura (through his character) in Elite Squad noted that the Brazilians use the same techniques as the Americans in Iraq for pacification. Through my own military training, I know the Brazilians use the same model as the Americans did in Iraq, based on techniques the Los Angeles Police consulted on. Wagner . 2014-16 may have been like the surge (Iraq 2006-07, see my blog/ book, http://www.lima37.com) for the olympics and world cup, and now it’s going to be like the years after the Americans left when all the security gains fell apart, ISIS came back; which may be good for certain businesses, including defense. It would be interesting to see what Brazilians think of this situation. Brazil made a formal application to join OECD. Getting into the club, at last and no longer an outsider. What changed? This week Minister of Finance Henrique Meirelles was in Paris for the OECD Forum. He participated in a ministerial panel. Talking to a group of delegates from Diplomacia Civil, Minister Meirelles said that the country’s entry into the organization would bring gains for both parties. According to Clara Nogueira, he stressed that for Brazil, membership would mean a richer and more direct dialogue with the most influential countries in the world economy, as well as increasing the possibility of intensifying trade relations with the private sectors of such countries. The minister also informed that being a member of the OECD would allow Brazil to modernize its economy, coming into contact with new technologies from other countries. According to an executive in the insurance sector: “OECD let Brazil participates in these meetings because they want to persuade us gradually”. He explained that in the insurance business, OECD has agreements about how export credit agencies can support their exporters in terms of conditions, assistance, risk spread, compliance with environmental requirements; and those foreign agencies are bound by these agreements in their Brazilian business. The rational is simple. A Brazilian exporter will be at a disadvantage when competing internationally. The Brazilian will have to pay a disproportional risk spread. OECD sets a standard, an independent benchmark that is recognised and prestigious. In fact, the OECD’s tradition of rule making in the area of officially supported export credits, dates back to 1963. By exchanging information on Members’ export credits systems and business activities, OECD has a major influence in national export credits policies relating to good governance issues. Not a bad idea when we think that it includes anti-bribery measures, environmental and social due diligence. Why are you afraid of globalization? 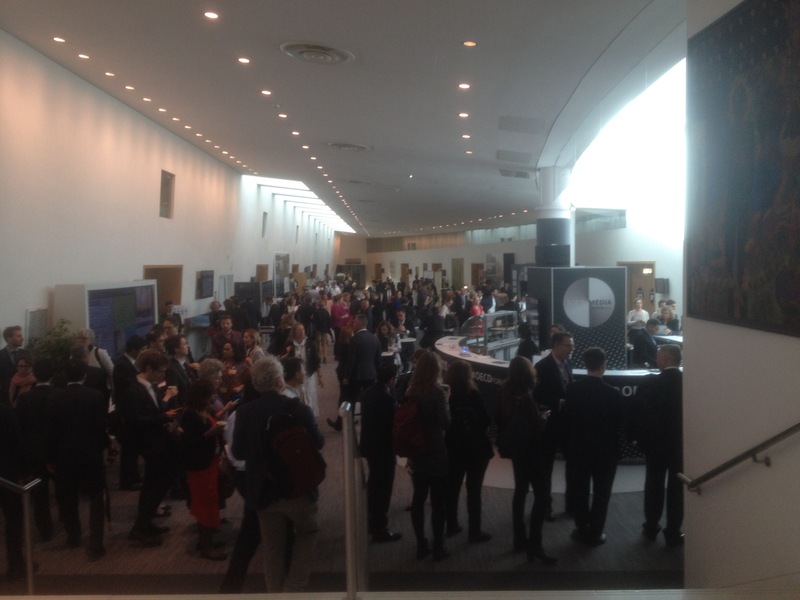 The idea that there is a fear of globalization was the most interesting thing I heard today at the OECD Forum.